Published: Sept. 9, 2018 at 05:50 p.m.
Washington Redskins tight end Jordan Reed reaches his arms across the goal line for a lunging 4-yard touchdown on a pass from quarterback Alex Smith. Published: Oct. 23, 2017 at 11:33 p.m.
Washington Redskins tight end Jordan Reed dives into end zone for a 12-yard TD. 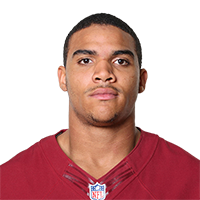 Published: Oct. 23, 2017 at 11:05 p.m.
Washington Redskins QB Kirk Cousins throws short to tight end Jordan Reed for a 5-yard TD.